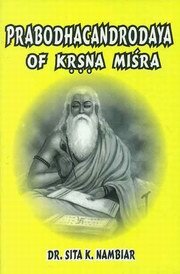 Prabodhacandrodaya of Krsna Misra is a profound philosophical allegory, in six acts, of the whole life of man. The author succeeds to a remarkable degree in giving us an ingenious picture of the spiritual struggle between virtue and vice the two forces of human mind in a dramatic form. There is lively satire too. On the devotional side there is an attempt to synthesise Advaitic Vedanta with Visnubhakti. Of all the allegorical plays in Sanskrit this must be singled out as an attractive work of real merit. The introduction in this book forms a part of the thesis submitted by the translator for a Ph.D. degree in the University of Bonn. While translating the text an attempt has been made to keep close to the original and to preserve the spirit of the text without violating the English expression. Dr. (Mrs.) Sita K. Nambiar, Former Principal, Daulat Ram College, Delhi University, completed her M.A. (Sanskrit) from Kerala University in 1946 and was a Gold Medalist. She was a scholar of the Deutsche Akademische Austausch Dienst (DAAD) and subsequently received her Ph.D. from Boon University in 1960. Her contributions were acknowledged in 1991 when she received an award for promoting Sanskrit Studies given by the Sanskrit Academy, Delhi Administration. Dr. Nambiar’s work includes a dictionary of common words in Malayalam and Hindi compiled for the Government of India and a number of articles written on Indian religion and philosophy. Her latest publication, The Ritual Art of Teyyam and Bhutaradhane, was released in 1996 by the Indira Gandhi National Centre for the Arts.